Abstract. A new family of ultra‐reliable mixers, developed by Mini‐Circuits, combines low‐temperature cofired ceramic (LTCC) circuitry and specially selected semiconductor dice in a hermetically sealed case (Fig. 1)—at 1/10th the price of comparable products on the market. Fully automated, tightly‐ controlled, and highly repeatable processes ensure excellent performance at temperatures up to 125°C. A well-established fact of life in the electronics industry is that manufacturers have no control over where, and how, customers choose to deploy their products. For example, take a high-performance instrument that works perfectly in an air-conditioned, high-altitude, Arizona testing lab, and ship it to an oil refinery on the US Gulf Coast. On the one hand, a relative humidity of 90% means ESD is less of a worry. But on the other hand, the entire assembly is soaking wet, relatively speaking. What to do? Plug it in and put it to work! Military suppliers have met these kinds of challenges for decades. Their RF and microwave systems may be stored for months or years, only to be shipped in an unpressurized cargo bay to a tropical staging area and on to a cold, high-altitude battlefield in a single day. Massive swings in temperature, pressure, or humidity, and very hard knocks, are to be expected, and nonperformance is not an option. Components that meet tough MIL specifications help make it all possible, but the high associated costs—for example $80 or more for a hermetic frequency mixer—have kept them out of reach for more tightly budgeted applications. High reliability is increasingly essential for commercial applications as well. The long‐term performance of aircraft, medical monitoring equipment, and 24-hour automated business systems are all critical, to varying degrees, for end-users, manufacturers, and investors alike. And at the same time, global competition maintains a downward pressure on price. Design engineers have no choice but to meet both of these demands. For over 40 years, Mini-Circuits has been working to close the long-standing price gap between commercial budgets and the costs associated with hi-rel components. By taking advantage of the latest developments in LTCC ceramics, multilayer distributed circuitry, and automated processing, we have found a way to meet customer demand for long-term performance, while reducing costs by a factor of 10. Our new Ultra-Rel® MAC mixers are the first of these products to come to market. 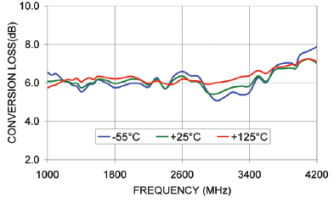 EM simulations enable the rapid prototyping of high-performance, double-balanced mixer circuitry, precisely matched to tightly-specified Schottky diodes. The pre-screened quads are attached to their purpose-built substrates with gold wire bonds. High-quality hermetic seals are then applied under a controlled, inert atmosphere, using gold-plated covers and eutectic AuSn solder. Automated singulation and 100% testing ensure the integrity and performance of every mixer we stock. 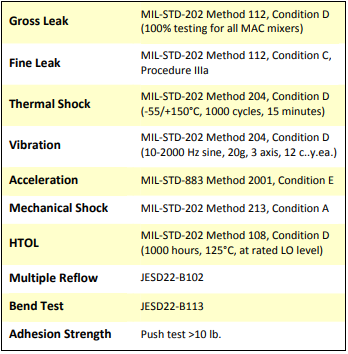 MAC mixers have already qualified for an extensive list of MIL-STD, JESD, and other specifications (Fig. 2). The results have been so consistently impressive, we’re backing them all with a 3-year warranty. These rugged, hermetically sealed ceramic models are ideal whenever long-term exposure to humidity, dust, airborne contaminants, or changing environments are a concern. Add the vibration, mechanical shock, acceleration, or high temperatures associated with busy production lines, high-speed distribution centers, server farms, automotive and aerospace systems, heavy industry, or hostile battlefields, and our ultra-reliable mixers offer even more value. But there’s a lot more to MAC mixers than just a rugged case: new technology enables new designs, and improved performance. 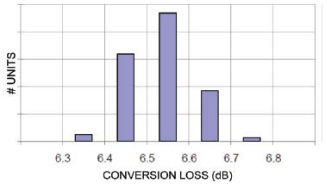 For starters, the extremely small package size of these mixers (0.3 x 0.25 x 0.06”) reduces parasitics and improves the frequency response, for low, flat conversion losses across broad bandwidths (Fig. 3). Figure 3. 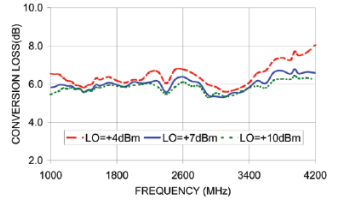 Typical Conversion Loss for the MAC-42+ (at IF = 30 MHz). Low parasitics also deliver better matching for the RF, LO, and IF paths, and consistently high isolation(Fig. 4). The inherent mechanical and thermal stability of LTCCs have long been recognized. These mixer designs take consistent performance across temperature one step further: all MAC models are rated for operation at up to +125°C (Fig. 5). High-volume automated processes ensure high unit-to-unit and lot-to-lot repeatability, as demonstrated by this conversion loss histogram, well within 4.5σ (Fig 6). Figure 6. Typical unit-to-unit Repeatability Histogram for a MAC-42 production run. Other advantages of these game-changing new mixers only become apparent as they are put to use. Standard tape-and-reel packaging allows the easy integration of hi-rel components into customer assembly processes. Gold-plated terminations provide excellent long-term solderability, with exposed termination ends for easy visual solder inspection, faster throughput, and greater quality assurance. And end-users will soon appreciate how consistent electrical performance adds value, day after day and year after year-whether in unmanned, remote installations, or temperature and humidity controlled instrumentation labs. Low loss, high isolation, temperature stability, and high repeatability are calling cards for the whole MAC mixer family. 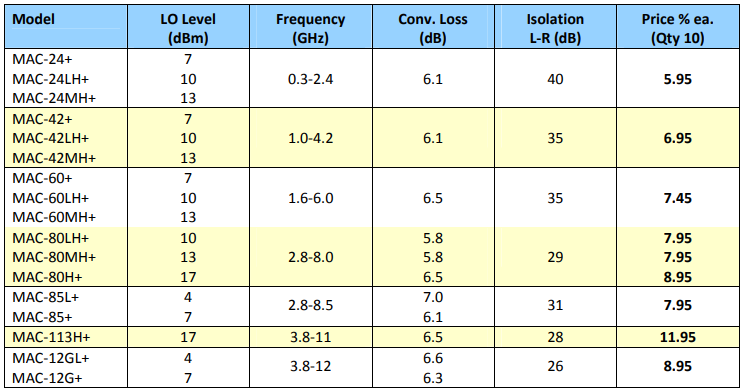 The first 17 models cover RF/LO frequencies from 300 MHz to 12 GHz, IF frequencies from DC up to 2 GHz, and LO power levels from 4 to 17 dBm (see Fig 7 for a complete list). 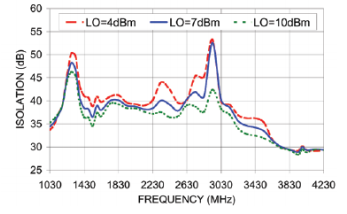 Other models under development are expected to reach LO/IF frequencies as high as 18 GHz. 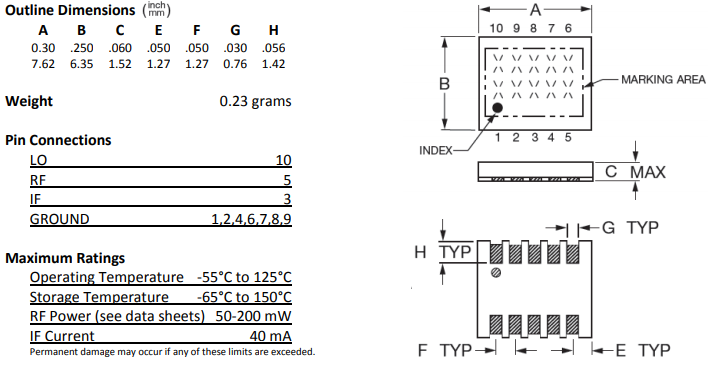 Data sheets, performance curves, S-parameters, outline drawings, PCB layouts, environmental ratings, green info, and everything else you need for a full, quick evaluation can be found at minicircuits.com. Or enter your requirements into our patented search engine, Yoni2, and it will search actual test data to find the models that meet your needs. All MAC mixers are backed by our exclusive 3-year guarantee, and prices, stock quantities, and real-time availability are listed for every catalog model. Looking ahead, the systems and processes developed for the MAC are proving to be highly adaptable for a whole range of ultra-reliable components combining LTCC passive circuitry with semiconductor devices. Amplifiers, attenuators, limiters, doublers and other components are already well into the design phase, and in some cases close to production. For more on our new hermetic ceramic products-that put Ultra-Reliable performance within the reach of tightly budgeted applications - just keep an eye on the New Products section at minicircuits.com! Figure 7. Key specifications and prices for the Mini-Circuits MAC mixer family. 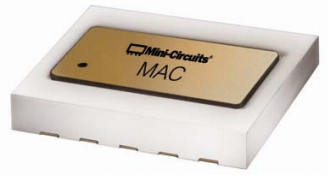 See minicircuits.com for individual datasheets, environmental specifications, and more, including pricing and real-time availability at higher quantities. Figure 8. Physical specifications, pin connections, and maximum ratings for Mini-Circuits MAC mixers.